I love onion rings. Admittedly, they are not the healthiest choice when it comes to things to make. The frozen ones, even when baked in the oven, are not the best thing for you but I still love them. I have tried a few times to make my own and have made them by baking them in the oven and by frying them, but I had never really tried a beer batter recipe before. I cam across this one in Saveur Magazine not long ago and had been waiting for the right opportunity to make them. I made some burgers for dinner one night last week and the onion rings were just the perfect accessory for the burgers. In a large bowl, whisk together the flour, cornstarch, paprika, dry mustard, baking powder and salt. Add the honey and the beer and whisk the mixture until it is smooth.. Allow the mixture to sit for 10 minutes. Pour the vegetable or canola oil to a depth of 2 inches in a Dutch oven or large skillet with high sides and heat the pan over medium-high heat until the temperature of the oil registers 375 degrees on a candy or deep-fry thermometer. Working in batches, dip the onion rings into the batter, shaking off any excess, and lower them into the oil. Fry the onion rings, flipping once, until they are golden brown, about 3 minutes total. Transfer the onion rings to a paper towel lined plate to drain briefly and season with more salt. Cover the onion rings and repeat the process with any remaining onion rings until they are all fried. Serve immediately. 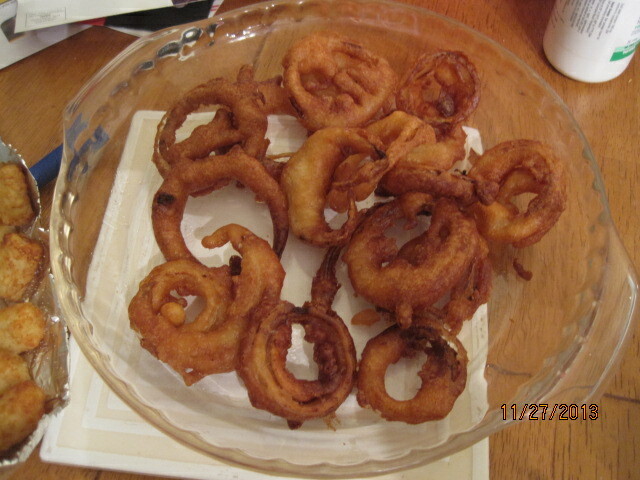 The batter was a lot thicker than I thought it was going to be and it made for an excellent crust on the onion rings. You got some really great flavor from the mix of the beer, honey and paprika and they were done quite quickly. We all loved the taste of them and devoured all the onion rings with our burgers pretty quickly. These would be great to make with any burgers or other sandwiches like a chicken sandwich or even with some corned beef or pastrami. They would also make an awesome appetizer or snack when you are watching a football game or having some friends over for a party. I’ll definitely be trying this recipe again. That’s all I have for today. Check back tomorrow for another recipe. Tomorrow is my birthday, so I will be posting the recipe Michelle used for my wonderful birthday cake that she made. Check back tomorrow to see what it is. Until then, enjoy the rest of your day and enjoy your meal!